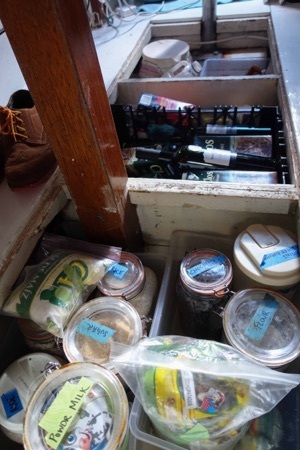 Dealing with food in a cruising sailboat is (in general) a huge task; and reviewing our food stocks is one of the first things to do after a passage. We often purchase cart-loads of food, which we have to sort and store in awkward compartments that can sometimes get wet or damaged by motion underway, or infested with moths. So upon arriving in port, the task is to remove and review all the items from food benches, bilges, and pantries; and re-pack it all. This is equivalent to unloading everything from your attic, via the tiny trap door, in order to sort it. Not necessarily that easy! Sabrina tackled this food review with enormous diligence. Our strategy to save money & have good provisions for quality meals on Green Coconut Run has been to “pack the boat to the gills” with food from Ecuador (and Pitcairn, once we realized what a good deal it was there!) This was in preparation for the exorbitant costs and limited supplies in French Polynesia. Walking around the stores here in town, we are almighty pleased that we took this approach! A bottle of rum: in Ecuador $6, in Rikitea $80. Kingston cookies (my favorite! ): in Pitcairn $3, in Rikitea $4.50. Olive Oil: in Panama $30, in Rikitea $60. The supply ship only comes to Rikitea every three weeks, and even then people say: come the next day at 7am, or else everything is bought up! So we are very glad we’ve packed as much as possible into Aldebaran for this coming season in French Polynesia, but the downside is that we have to review our stocks to check for damage or spoilage once a month or so. You guys are amazing!! What can we bring to assist we we arrive? For sure, well bring dark chocolate bars…that’s the only dessert I eat due to being on a low sugar diet.